Come summer time, there’s no better way to cook a bird than over a bed of hot coals. 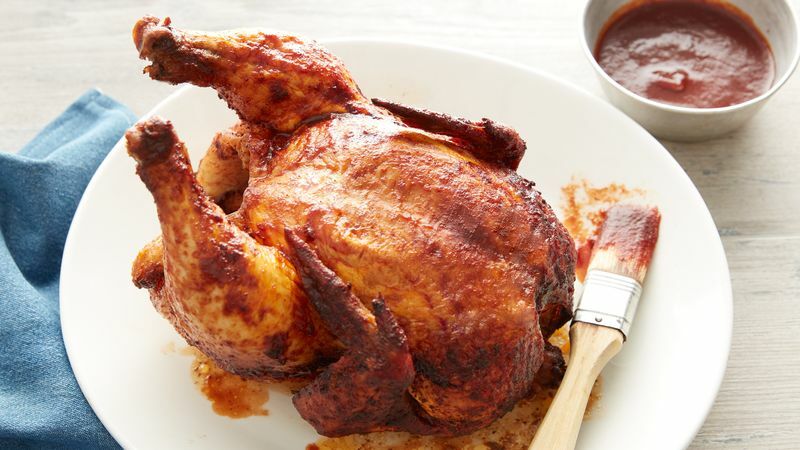 Grilling a whole chicken guarantees tender, succulent meat, but only if done correctly — if you just place your chicken on the grill, you’ll end up with a burnt, blackened mess. So, here’s the secret: a tender and juicy grilled chicken starts with a beer can. Propping a chicken up on a beer can allows heat to circulate all around the chicken, so it cooks evenly – sort of like using a roasting rack in the oven. At the same time, the steam from the beer seeps into the chicken’s cavity making it extra moist. While the rub or marinade gets baked on adding tons of flavor. Is your mouth watering yet? This super simple technique is also perfect for cooking a whole bird in the oven. But for now, here’s the nitty-gritty behind making a perfectly grilled beer-can chicken (on your first try). When shopping for a chicken, look for a 4 to 4 ½ pound bird that’s plump and meaty with smooth, moist-looking skin and no traces of feathers. In prepping your chicken, blot dry with paper towels. Not only will your dry rub or marinade stick better, your chicken will begin to cook right away, instead of steaming as it does when overly moist. And, don’t forget to remove the giblets from inside the chicken’s cavity. In preheating your grill, you’re aiming for indirect heat. On a two-burner gas grill, heat one burner to medium. Place chicken with beer can upright on the unheated side. On a one-burner gas grill, place chicken on grill over low heat. On a charcoal grill, move medium coals to the edge of the firebox. Place chicken with beer can upright on the grill rack over a drip pan. Before inserting the beer can into chicken’s cavity, pour out ½ cup. (Cook’s choice on what to do with that beer!) Holding the chicken upright – larger cavity facing downward – insert the open can into the chicken’s cavity. If you have an ovenproof thermometer, insert it into the thickest part of the thigh being careful to avoid the bone. When moving the chicken to and from the grill, you’ll want to place in a pan in order to avoid tipping. To lift your chicken into the pan, grip with tongs and lift from beneath with a metal spatula. Remember in order to avoid cross-contamination, you must wash any utensils used to touch the raw chicken before using them on cooked chicken. Chicken cooked this way usually takes about an hour or so, but always follow the recipe instructions. Let chicken stand 15 minutes before carving. Beer can and contents should be allowed to cool before discarding. Now that you’ve got the why and how down, get started with this step-by-step tutorial on how to grill beer-can chicken. And once you’ve mastered this method, you’ll want to try your hand at all of Betty’s beer-can chicken recipes.